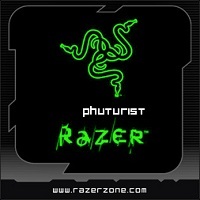 Congrats to kakis dadzzky and Phuturist for qualifying the satellite. GG and well played everyone! Seeya all on LWPS and I'm looking forward to making more friends on board, and a better showing for me! Congrate dadzzky n phuturist.Both of u are always on the top of the list!! !Shown that had maintain n improve in your poker play,Cheers!!!! Search for Tourney Number 400223746. Congrats to arknight87, CHEEeMAN and chessvic53 for winning the LWPS VIII ME seats. P/S: chessvic53, you are the 3rd Russian that won the seat. Please make your way to MV Leisure World. Free chicken wings on us! Seat bubble & satellite bubble boys dun be sad. We treat you chicken wings as well. Satellites will be running thrice weekly(every Tue, Thurs and Sun) in June, on the 2nd, 5th, 7th, 9th, 12th, 14th, 16th. All satellites will take place at 9pm (GMT + 8). Simply click Tourney/Regional to locate the satellites. 1 Seat is guaranteed for every satellite! 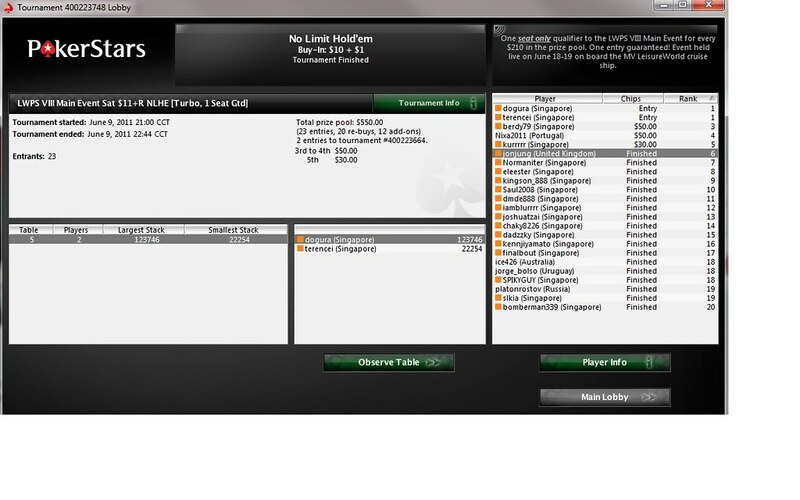 Qualify for the ME on Pokerstars! *Note that if you win more than 1 seat, you will receive T$ for the additional seats. 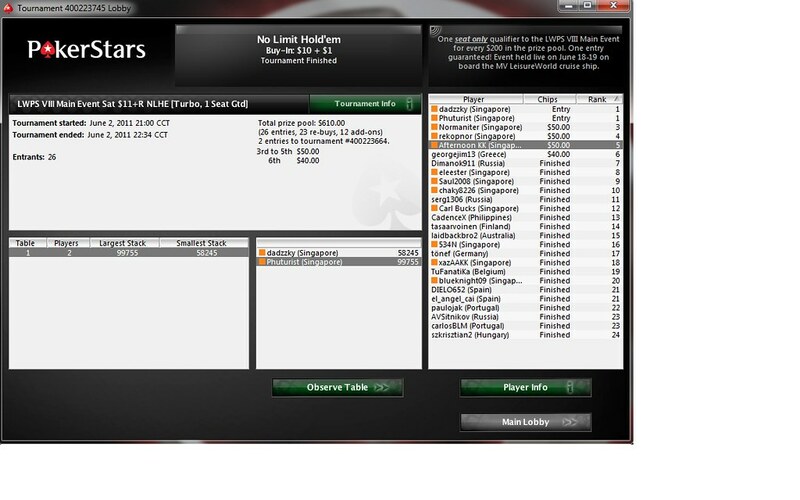 DM101 wrote: Congrats to arknight87, CHEEeMAN and chessvic53 for winning the LWPS VIII ME seats. Haha Chris, I hold you to your words ah.. lol.. Free chicken wing for Necrohaven and me lol... I bubble 2 times already lo... PokerGod pls let me take down this Sat at least once!!!!! Popi popi!!! 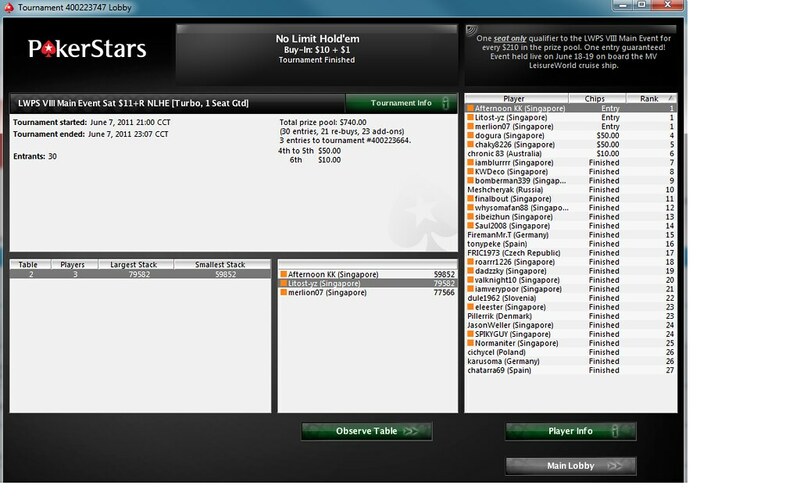 Congrats to Afternoon KK, merlion07 & Litost-yz for winning the LWPS VIII ME Seats. See you guys on LW soon. 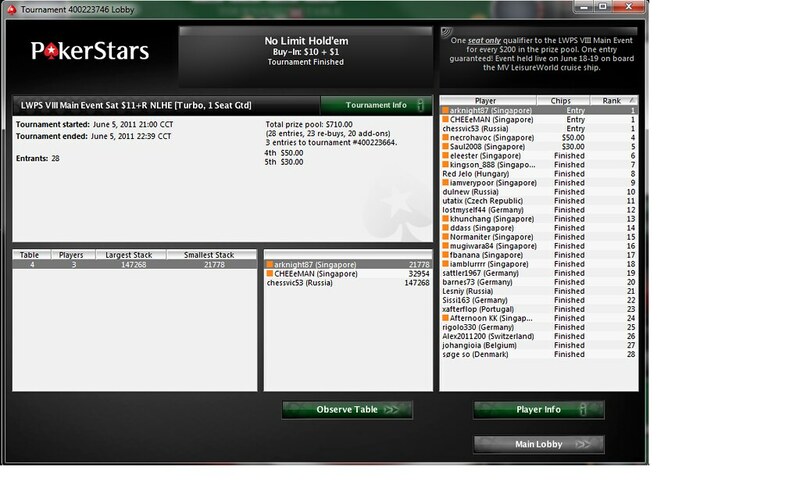 ikelos wrote: LWPS VIII ME satellite on Pokerstars tonight folks. 9pm (GMT+8). 1 Seat Guaranteed! hi ikelos, if i win more than 1 seat, can i "arrange" for someone else to take that seat? we've checked, and unfortunately its the default setting on the Stars system, so you have to receive T$. 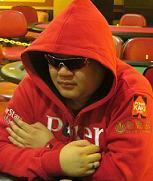 Congrats to kakis dogura ans terencei for winning the LWPSVIII ME Seats. No need,just tell them yr ps nick on board,they will let u play!